Hello my little Tinsel Toes. It’s Christmas tree day! Well I’ve done well so far haven’t I ? Day 3 and going strong. But first let’s talk about the advent goodies from the first couple of days. December 1st tea – “Snow Day” The scent was really strong even in the tin so I was not sure how I would feel about this one. But I really enjoyed it. It was more mint than chocolate and there was almost a tingle to the palate. I would buy it again for a nice winter warmer. Short Story day one was “Hunger Strike” – by Kevin Wilson. I really enjoyed this story. Well drawn characters and a really funny premise. December 2nd tea was “Jumpy Monkey” Hmmmm not for me. Short Story day two was “Under the Taps” by Anakana Schofield Another funny story. I did not know this author before I read it but half way through it mentioned Dublin and when I started reading it with an Irish accent I enjoyed it even more. True story – Any time I read something written by someone from Ireland I find it is more enjoyable when I get the accent right in my head. There is something about how they construct a sentence that is different from any other writing. But now on to the tree. 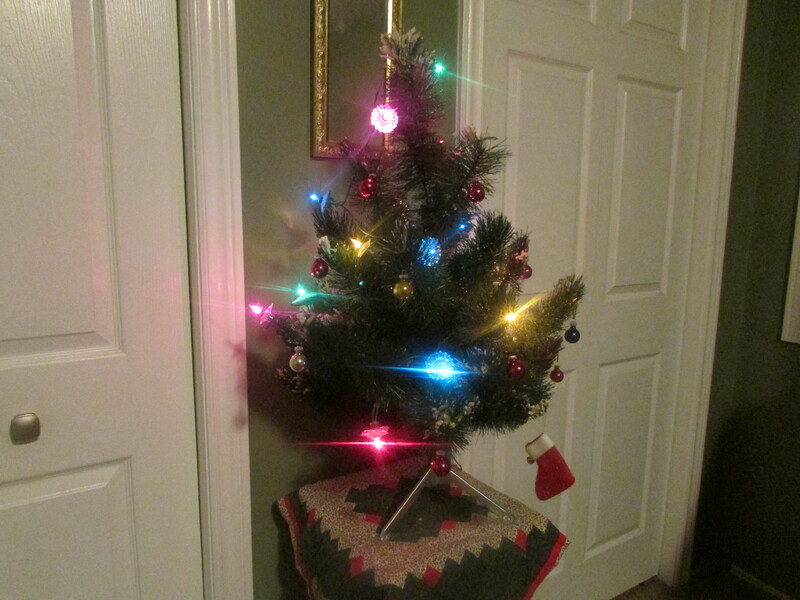 I like to get the tree up and decorated as close to the first of December as I can. 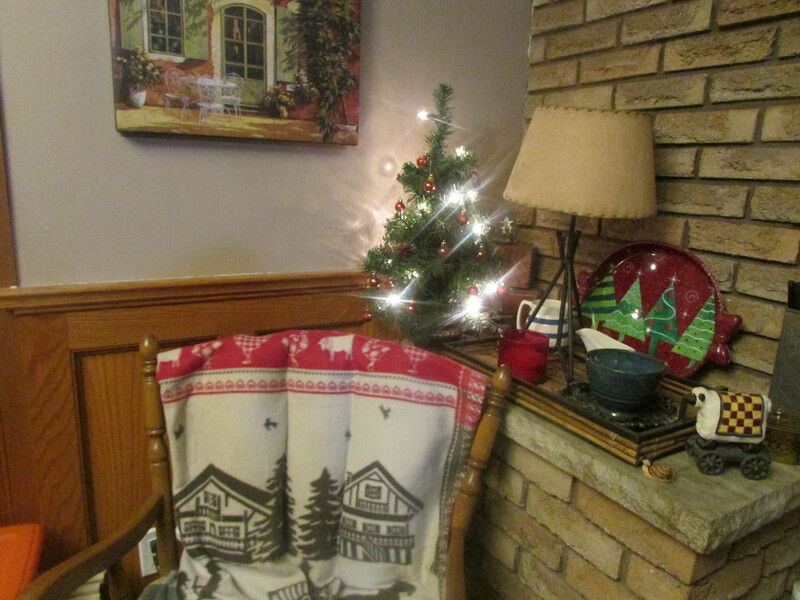 Here at Hedgehog Hill we are lucky to have a sun room that has a higher ceiling because I like to put my tree up on a table or bench. I love that it feels taller and it creates more space for presents underneath. 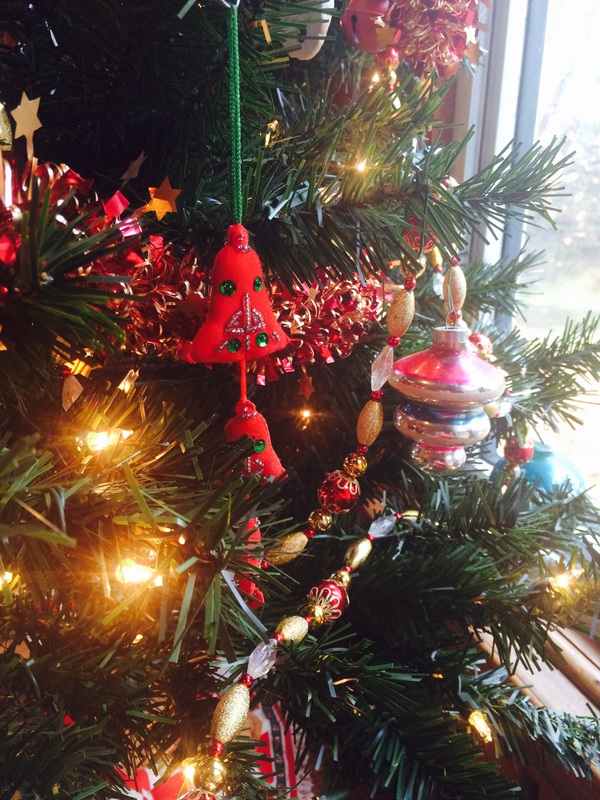 When the kids were little it helped to keep tiny hands from some of the more precious and breakable ornaments, I also used to tie the tree off to the wall after one memorable crash with Miss Murfin on the floor amongst the branches blaming it on the cat. Putting up the tree is always a big chore. I am so glad someone invented the pre-lit tree as un tangling lights is a nightmare. I am a white lights person on the inside tree, but enjoy the multi coloured lights outside. Are you white lights or coloured lights person? Static or flashing? No flashing in my house please! I have a really eclectic tree. several years ago I found some stringed bobbles and tinsel garland that is dark red (almost burgandy) and antique gold. You can see a bit of it in the picture above. I treasure these carefully as I have never seen others like them. I do watch at thrift stores and such in case someone else is changing colours and gets rid of some the same. Most of my ornaments are glass. I really like the way they reflect the light and are so delicate. My favourites are the antique ones. The little glass pinecones are the most adorable. A few are from special gifts. My decorating theory is to just keep stuffing them on until I can’t find any more branches. I also have a couple of other trees around the house. a tiny one beside the fireplace that glows over my shoulder as I sit to read my short story and sip my tea. I love the idea of a personal tree in your room, or somehow making your tree your own, be it decorating a plant you already have, or creating a tree out of objects. I could certainly find enough books to stack and make into a tree. Love this! What a fun idea, and gets me into the Christmas spirit. Adore trees, and yours are beautiful. 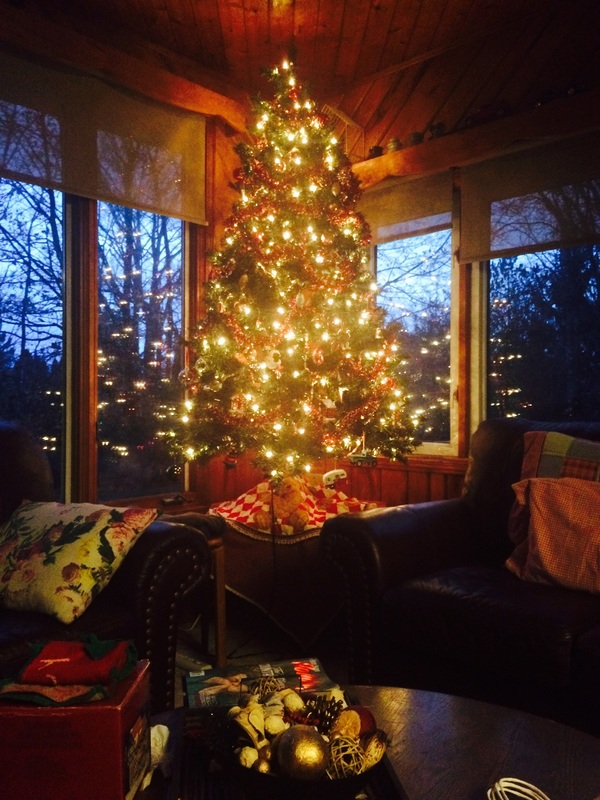 Short stories, advent calendars, teas, trees- all such wonderful cozy things to read about. Thank you for sharing your Blogmas! Great reading (loving falling snow across the page btw).